Healthcare facilities pose a unique design challenge for heating, ventilation and air-conditioning (HVAC) systems that provide a broad range of ventilation requirements and protection from airborne hazards for patients, workers, and visitors. From operating rooms and laboratories to waiting areas and patient rooms — the risks and appropriate safety measures vary from space to space. 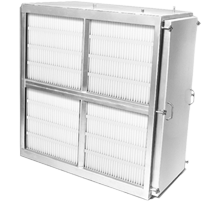 Our experts provide particulate and gaseous filtration solutions to respond to every area in your healthcare facility.